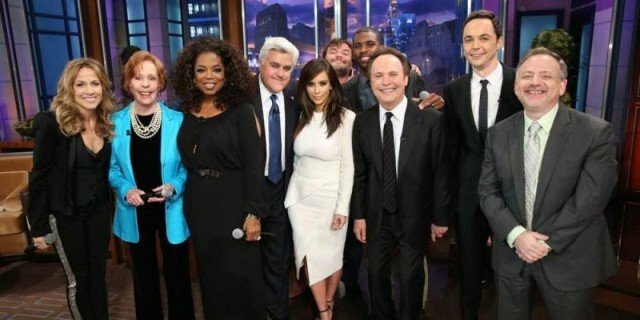 Jay Leno has taped his final episode of The Tonight Show, with help from a few celebrity guests. Jay Leno, 63, appeared emotional as he thanked viewers for their loyalty after his 22 years as host. The long-time television host was joined by high-profile guests including Billy Crystal, Oprah Winfrey and Garth Brooks. Fellow comedian and late-night host Jimmy Fallon, 39, takes over the program on February 17 in New York. Jay Leno was briefly replaced on The Tonight Show by comedian Conan O’Brien in 2009, but returned to the show in 2010. President Barack Obama was one of many to send in taped goodbyes, offering to make Jay Leno an ambassador to Antarctica. “I hope you’ve got a warm coat, funny man,” Barack Obama joked. Other celebrity guests on Thursday night’s show included Jack Black and Kim Kardashian. Brooks closed the program by performing his hit song, Friends in Low Places.